Add the boiling water and cocoa powder into a large bowl and mix well to create a paste. Cream the butter and the sugar, add the cocoa paste and stir to combine. To make the icing and filling, add the chocolate and cream together in a bowl and melt over a pan of simmering water. Stir occasionally. Leave aside to cool and wait until it is almost set. Once the cakes are done, remove from the oven and allow to cool completely. Use a quarter of the icing to stick both cakes together and spread the rest on top and around the sides. To make the ears, colour some sugar paste brown, roll out and cut an ear shape. Roll out and cut smaller ear shapes from white sugar paste and dust with gold edible glitter. Stick the inner and outer ear together and pinch together at the base to create a 3D shape. Allow to dry and harden. To make the antlers, roll out the white sugar paste and cut out antler shapes. Paint gold and allow to harden. To create leaves, colour the buttercream green and pipe around the base of the cake using a leaf nozzle. For the eyes, colour some royal icing black and pipe directly onto the cake. Pipe frosting in swirl pattern to create a mane across the top and slightly over the edge at the front to create a curl of hair. 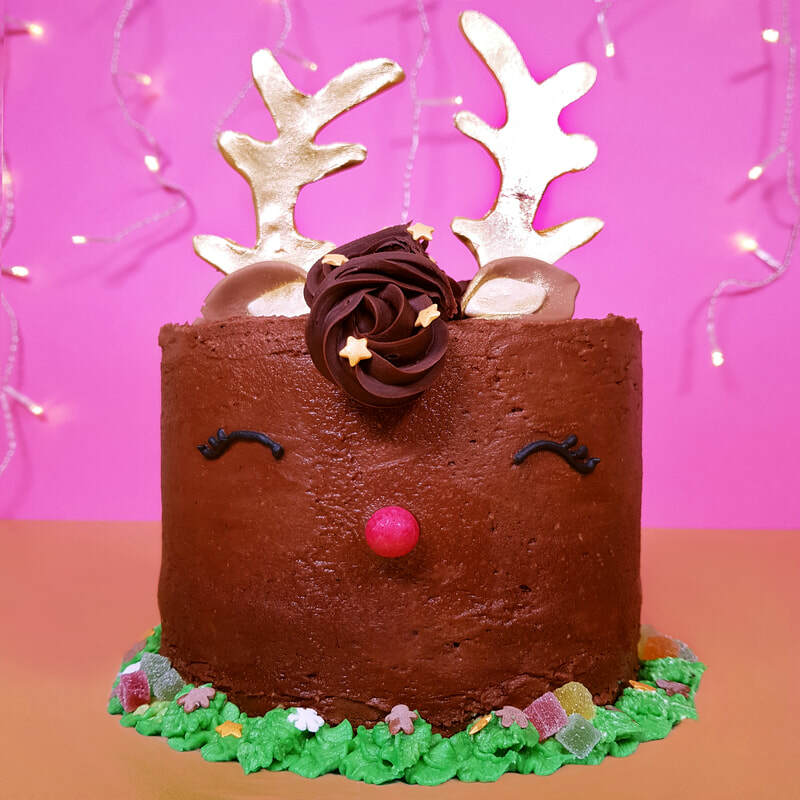 Insert the antlers on top of the cake and position the ears just in front. Add a red Popping Candy piece to create the reindeer nose. Add Fruity Cubes Sprinkles to the green leaf buttercream and add Christmas Sprinkles. Add the golden stars from the Christmas Sprinkles to the frosting mane to decorate.